I was all of 10 years old in 1965; a thin, scrawny boy well into his second term at Mayo College, Ajmer. Life was innocent and blissful. It revolved around the next meal (you have to be in a boarding school to understand), avoiding having to drink the tepid milk before games and waiting for the Saturday night movie in the open-air theatre. Once a month, there would be pocket money - a cheque for the princely sum of 50 paisa (yes, 50 Paisa) - which was promptly encashed at the Saturday night movie for a coke and a kachori. One felt like a king with a coke in one hand and a kachori in the other while watching a movie. Life couldn't be better. The Indo-Pak war of 1965 was to change all that. The first sign of change was when my mother wrote to me to say that my father (Late Air Vice Marshal C G Devasher PVSM, AVSM), who was in the Indian Air Force, had been prematurely pulled out of the National Defence College in New Delhi, promoted and posted in Ambala due to tensions with Pakistan and apprehensions of war. Ambala? Where was that? And war? War was what happened in Biggles' books and in comics about World War II. Could it be happening in real life? Next, our House 'farashes'- helpers, started digging trenches in the front lawn of Colvin House. For a while it was fun jumping into them and clambering out till the practice air raids started, especially at night. It was no fun then, trying to find your trench in pitch-black darkness along with a hundred other sleepy boys. Finally, Mr Gibson, our principal, drove into our House one evening during prep and gently broke the news to one of my friends that his uncle had been killed in the fighting with Pakistan. None of us had seen or known about death up close till then. I don't think we even realised what it was or its implications. But that innocence was to be shattered forever. I was to learn later of my father's brush with death. He was staying in the Officers Mess in Ambala when one night the Pakistan Air Force carried out an air raid. They hit the wrong targets including the Military Hospital and a church, but a bomb landed pretty close to the Officer's Mess and a shrapnel from it whizzed past my father, narrowly missing him. For years, I used the shrapnel as a paperweight. I had heard stories from my father about two Pakistan Air Force (PAF) Officers, Asghar Khan and Nur Khan (both went to head the PAF). My father had served with both in the Royal Indian Air Force: Asghar Khan was his flight commander in 9 Squadron flying Hurricanes over Burma in World War II and Nur Khan was his flight commander in 4 Squadron flying Spitfires. During the 1965 war, Air Marshal Nur Khan was the Pak Air Chief, having succeeded Air Marshal Asghar Khan in July 1965. After my father passed away I had a look at his 'log book' and saw the comments and signatures of Asghar Khan and Nur Khan dating back to 1944-45. I imagined bumping into Asghar Khan or Nur Khan somewhere, sometime, introducing myself and mentioning my father. I was sure they would remember him fondly and for an instant would have a far-away look in their eyes, as if remembering what had been. But in an instant, that instant would be gone. We would be back in our realities, in our antagonistic present. The trenches were filled up soon enough. The air raid sirens stopped, as did the practice drills. I missed the trenches for they had provided a lot of fun but I was glad they were gone because it meant that the war was over. When I was in Ambala for the winter holidays, I heard a lot of stories about the war from my father. About the aid raids, about the dog fights, about how valiantly our pilots and soldiers had fought. I used to get goosebumps hearing such stories. Even three months after the war, signs of it were visible everywhere. I saw the bombed church that was yet to be repaired. Luckily, the Military Hospital was up and running almost immediately. I saw the marks of the air raid in the Officer's Mess where my father had stayed and almost lost his life. But things had changed, I had changed. The innocence was gone. I saw and heard the pain of the wounded in the Military Hospital. I saw the bombed out church. I had learnt about death, about how close it came to us personally. Life for the 10 year old could never be the same again. 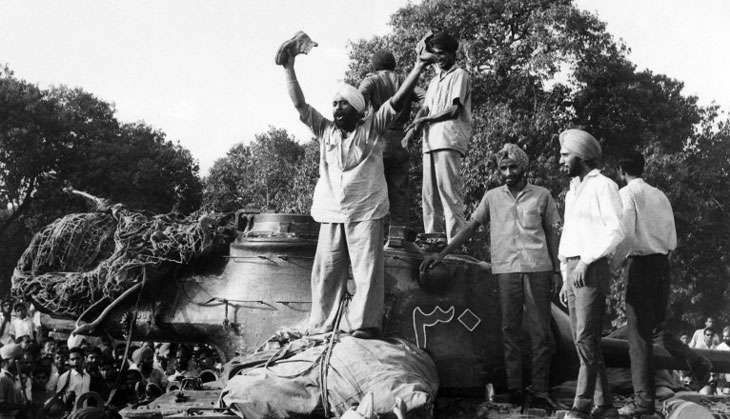 Today, when I look back five decades, I can still see a thin, scrawny 10 year old boy clambering into a trench, trying to make sense of what was happening and clinging to a world that was to change irretrievably due to the Indo-Pak war of 1965.